With the new year in motion, it’s time to look forward, and from a restaurant perspective we’ve got lots to look forward to in 2011. Here’s a little taste. Spinasse, the cozy Capitol Hill cascina known for its delicate handmade pastas, is set to double its dining capacity and encompass a new bar when it expands north into the existing storefront at 14th Avenue and East Pike Street. “I don’t want to mess with the intimate feeling,” said chef Jason Stratton, who runs the place with a creative eye toward Piedmont and the help of manager Michael Galloway. Their plan: to create a mirror image of the current dining room in an adjacent space, and install a corridor leading to a contemporary-styled bar, Artusi, on the corner. Artusi (honoring the author of a classic Italian cookbook) will feature a 12-seat counter where, come May, you might perch for a plate of pasta and a glass of wine. “One of the attractions of Spinasse is seeing what’s going on in the kitchen,” said Stratton, who intends to keep “that peek-a-boo look” into his culinary workshop and create a new glassed-in pasta-making area as a visual draw. Tom Douglas is getting serious with openings this year, and those, too, will provide looky-loos with vivid visuals. Serious Pie Westlake is set to debut any day. His second pizzeria bears a resemblance to its sibling off Fourth and Virginia — right down to a view of the new Dahlia Workshop: the “working name for the wholesale arm of the Dahlia Bakery,” says Douglas, and not a second retail bakery outlet, as rumored. “We’re moving the bread bakery and the pastry kitchen into Westlake and Harrison. So, while you’re eating pizza, you can watch them make coconut cream pie.” Adding intrigue, this dual-level set-up shares the corner space (formerly Napa Auto Parts) with Douglas’ buddy Michael Teer’s new wine shop, Soul Wine. Pizza, workshop, wine: you’ll find it here at 401 Westlake Ave. N.
Tom’s better half, Jackie Cross, upstairs at the new Serious Pie (left), and their pal Michael Teer (you may know him from his other wine shop Pike & Western), who shares the space downstairs at Soul Wine, now open for business. Nearby at the Terry Avenue Building between Thomas and Harrison streets, there’s more in store for Tom Douglas Restaurants: three (!) new ventures under construction and set to open in April. Downstairs, Douglas and his wife, Jackie Cross, will venture into Italian restaurant territory. “All the pasta will be made by hand, rolled — the way I like it — not extruded.” Upstairs in the historic brick building, they’re creating a tavern (21 and older) with a pretzel bar where you might hang out watching pretzel dough rise, boil, then bake in a brick oven. Or feast your eyes on other entertainment: like darts, shuffleboard and the M’s game on TV. Meanwhile, next door at the new 25-seat Tibetan restaurant Ting Momo, chef Deyki Thonden will have free rein to showcase her considerable dumpling-making skills, her boss says. Crews hoist a tree in the courtyard adjacent to the Terry Avenue Building, where three new Tom Douglas-branded restaurants are presently under construction. 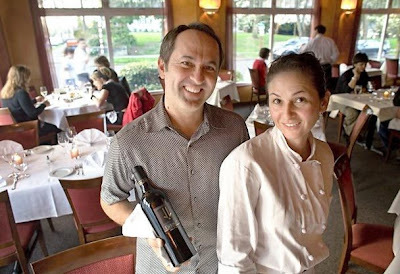 Madrona loses a long-timer when Dulces Latin Bistro closes at month’s end. Consider that bittersweet news, because owners Carlos Kainz and Julie Guerrero will take their worldly wine list — and their baby grand — and make a big move to a smaller venue on North Capitol Hill. Kava Bistro and Wine, just off the corner of East Republican and Broadway East, is expected to open in the mixed-use Joule complex in March with 60 seats (including a petite bar), a larger selection of small plates and favorites from Guerrero’s Euro-Latina cucina. Keeping the noise level pitched at romance is part of the plan, and monthly tango nights will continue, said Kainz, who’ll also run a tiny wine shop on-premise. As for the old Dulces space, kind neighbor Darren Pritt (who’s invested in Belltown’s Branzino) plans to open a pizza joint [update 1/11: though not a brick-oven pizza joint, as I previously reported] and turn what was once Dulces’ cigar room into a kid-friendly romper room, Kainz said. As promised, Tilth’s Maria Hines has scored a venue for her second restaurant: Golden Beetle will settle into Ballard, taking over the short-lived pizzeria Via Verde at 1744 N.W. Market Street, which stood far longer as the Market Street Grill. 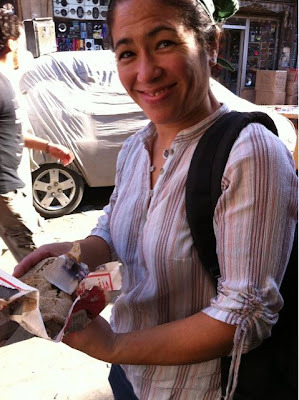 Hines is presently globe-trotting in Beirut, Cairo and Istanbul, gaining inspiration for a menu focused on the Eastern Mediterranean and rife with “salty, crunchy, spicy stuff.” Upon return, she’ll paint the place (expected to debut in late February) and install “some cool Turkish lanterns” and photographs from her trip. “Fun and playful” is the mood she’s going for, but that said, “I’m not going to have girls dressed up like ‘I Dream of Jeannie’ or guys with turned-up slippers,” Hines quips. What she will have, at least initially, is help from her longtime sous-chef Larkin Young. 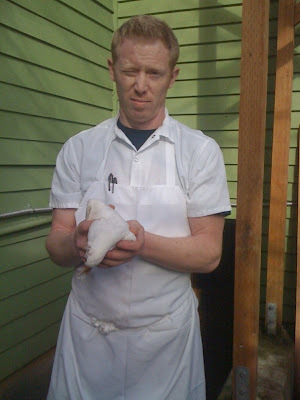 That young talent left Tilth in November and plans to open a restaurant of his own sometime this spring. He’s got the name — Spoon — and hopes to find a turnkey operation in a North End neighborhood to call his own: one of many new restaurants I hope to lift a fork (and a spoon!) in during the coming year.